Riedel Vinum Wine Glasses make every drop of wine taste its best. Riedel revolutionized glassware by customizing the shape of wine glasses to a particular type of wine. Each wine glass is fine-tuned to direct the flow of the wine onto parts of the palate that will best express the flavors and aromas of a specific wine varietal. The fine crystal offers superb clarity so you can experience the wine's color and texture.Moreover, all machine made Vinum stems are completely dishwasher safe. The Ridel Vinum Pinot Noir / Burgundy wine glass is ideal for full-bodied red wines with high acidity and moderate tannins. Its slightly tapered rim directs the flow of wine toward the front palate, highlighting the rich fruit while tempering the acidity. The generously sized bowl provides ample breathing space for the bouquet to develop, capturing the nuances of the wine's aromas. Recommended for: Barbaresco, Barbera, Barolo, Burgundy (red), Gamay, Nebbiolo, Pinot Noir. BEST ANSWER: I haven't done a side by side comparison, but it is the size and shape of the bowl that affects the experience of drinking wine from these glasses. All of the Riedel products are excellent. While there may be some people that can tell the difference between the classic and XL, they are very few and far between. Thus if you prefer a shorter glass, go with it and enjoy. the xll can really bring out a nose with some red burgundies. i've been impressed on occasion. but for the money and for practical reasons, i really like the classic. does white and red, new and old world pinot well. hope that helps! 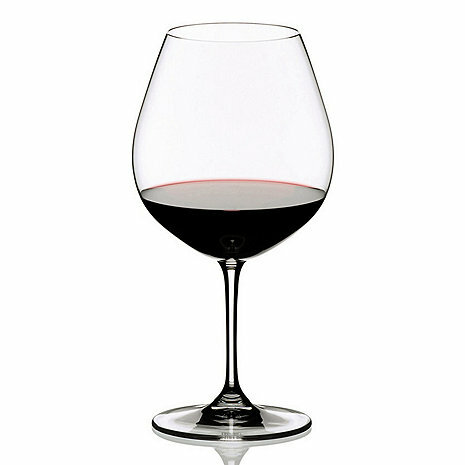 The Riedel Vinum Pinot Noir/Burgundy Wine Glasses are equally as good as the Vinum xl. The Riedel Vinum Pinot Noir is 8 1/4 inches high and holds 24 3/4 ounces and the XL is 9 1/2 inches high and holds 28 1/4 ounces. Can I get these engraved? BEST ANSWER: Thank you for your question, yes the Riedel Vinum line can be engraved. Please feel free to reach out to our sales consultants at 800-356-8466 and they can assist further. What are the mouth and bowl diameters of this glass? BEST ANSWER: mouth is 2 3/4"
widest part of bowl is 4"
Is this the appropriate glass for zweigelts and/or blaufrankisch? BEST ANSWER: I would say yes, you can use that glass for either varietal. These Riedel Vinum wine glasses are the best for really enjoying the essence of the wines. They are a bit fragile, but normally fine if you're careful. They also make a beautiful presentation. I love them. These are fabulously attractive and functional glasses. The one problem we've found: the stems on the Burgandy glasses seem to be more delicate than the stems on the Bordeaux glasses and have snapped off while hand washing them. The price is reasonable for replacements, and worth it in our estimation. Pouring a fine wine into a fine glass enhances the pleasure. Wine really tastes better in these glasses! And they are a great shape for opening up the red wines we love so much as we're huge Pinot Noir fans. Actually, all our reds go in these glasses because we love the shape so much. While I don't love hand washing these glasses, they are worth it the extra effort. This is a beautiful lead crystal glass. Although it says it is dishwasher safe, it is not recommended that you use a dishwasher on lead crystal you are drinking from. For this reason, I choose to handwash. Otherwise, this is a excellent glass with beautiful sounds and durability. The Reidel Vinum collection is perfect for every day use as well as entertaining. This purchase was to increase my current collection. The glasses arived within 3 days of ordering in perfect condition. Glass broke while hand drying first time used. I was simply wiping the rim of the glass and it shattered. I was surprised how fragile these are giving the price point. The glasses were what I expected. They are attractive, easy to clean and seem durable with proper care. I would buy more glasses if needed. a perfect glass really. wonderful shape -- not too big and not too small of a bulb. elegant and practical. nice enough to feel luxurious and inexpensive enough that i don't cry when we break one. glasses, like, wine, are meant to be used and enjoyed. We love Riedel. We will continue to buy them whenever we can afford them. They are worth every penny. They are delicate, but so what. Life is short. Enjoy your wine in style. Riedel has the perfect glass for every wine and it does make a differance. I use this glass when serving pinot noir or burgandy. It is also a great all purpose wine glass. Feel in love with Reidel over 20 years ago and still feel the same. Wine is less without the appropriate presentation. Wine Enthusiast was outstanding in replacing one of the glasses that was broken upon receipt. Customer Service Rep was excellent. Well done! Riedel stemware is the only stemware to use when drinking fine Pinot Noirs and Burgundies. We strongly recommend them.. This is quality glassware. Liked them so much I have given them as gifts. There glasses are attractive and wide enough to air the wine. These glasses are dishwaser safe,but you need make sure they will fit on the top shelf of your dishwasher. Have not used them yet. Will use them for an upcoming Piedmont Party. Glasses are great and work in dishwasher - which is nice. Little expensive - but once you get past that - they're great. I wash them by hand. Seem delicate but do say "dishwasher safe". Not only do I recommend them but bought some for my friends. These glasses are just as I expected. Holding one you feel like it's a 'very nice glass'. The only negative is that they are fragile. Accidentally knocked over.